ETR Model Sample Lesson | GoZen! Welcome to your first sample lesson! Below, you’ll find animations used to teach students about how thoughts impact reactions. The first animation is an explanation and the second is a scenario quiz. Each animation is then followed by key learning points to reinforce the lesson. Remember, you’re only seeing you a snippet of what’s covered in the modules. In the full program, there are over 12 different animations related to emotional intelligence, including fun explanations of the science behind each concept! 1. Thoughts Matter – The ETR Model! Most people think that “events” or problems cause “reactions” or behaviors/feelings. In reality, Events cause Thoughts which then cause Reactions. For example, let’s say your friend borrows a movie and promises to return it before the weekend. On Friday, you discover he wants to keep it another week (the event). You get upset (the reaction). Now, the common belief is that you got mad because he returned the movie late. In other words, the event has led to the reaction. This is not the case! Getting upset over your friend returning the movie late is actually caused by the Thoughts in your head. Not directly by your friend returning the movie late (the event). To recap, activating events (challenges) do not directly cause reactions (feelings and behaviors). Instead, activating Events -> lead to Thoughts -> lead to Reactions. 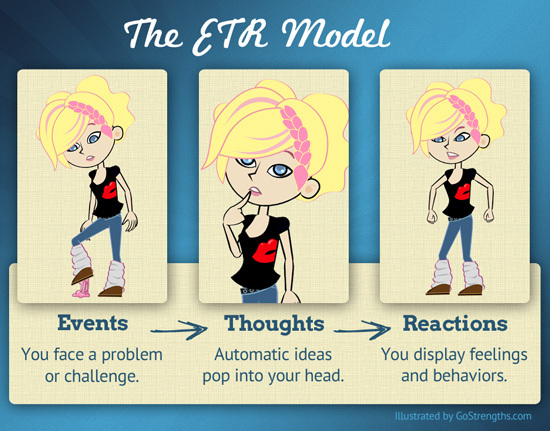 This it the ETR model. In sum, every reaction you have to a challenging event in your life is not because of the actual event, it is because of your interpretation or thoughts about the event. Different people have different thoughts. This is why different people can have different reactions to the same exact event in their lives. Getting to know your own thoughts and thinking style can increase your understanding of why you feel and behave in certain ways. It can also increase your resilience or ability to overcome your challenging events. She wants to play four square. Lisa Silver was mean to her. She wants to be accepted. She is crying because of her thoughts. The answer was D. Did you get it right? While the ETR acronym is unique to GoStrengths!, the process of thoughts causing behaviors and emotions dates backs quite a while. There are several schools of thought regarding what causes us to do what we do including evolutionary, psychophysiological, neurological, and cognitive perspectives. The GoStrengths! ETR model is based on the cognitive perspective developed largely on research by Aaron Beck, Albert Ellis, and Martin Seligman. Ellis, A., & Bernard, M. E. (2006). Rational emotive behavioral approaches to childhood disorders theory, practice and research. New York: Springer. Seligman, M. E. (1991). Learned optimism. New York: A.A. Knopf. I’m a Proud Parent! OR I’m a Therapist, Coach or Educator! P.S. Be sure to check your email for more sample lessons. P.P.S. We are real people! Please reach out to us with any questions at go@gozen.com. We look forward to getting to know you.